Yang Eun Bi is a University student preparing for her civil service exam with the dream of being a high school teacher. She accidentally encounters Cha Chi Soo, the an arrogant son of the biggest food conglomerate in Korea. Both of them ends up working at a ramyun shop operated by the lazy Choi Kang Hyuk. This romantic comedy deals with "pretty boys," who with good looks and individuality, operate a ramyun shop with lively college girls and experience the happenings of daily life. A highly recommended drama. The story line had a bit of mixture of the hit dramas - Boys over flowers, Secret Garden and Biscuit Teacher. The recipe was well prepared and this drama turns out to be a tasteful bowl of Ramyun. 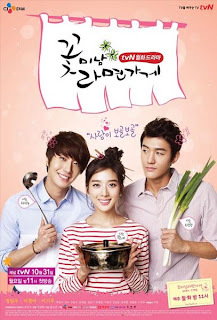 Coincidentally this drama is linked to one of my favorite food (ramyun). This is a romantic comedy and I did not expect this drama to have a good storyline. To my surprise, the scriptwriter Yoon Nan Joong manage to sustain my interest in this drama. It was a fun journey to watch as the story unfolds. In every episode, they have a theme and the story will revolve around that theme. The director Jung Jung Hwa managed to get the right actors on board. The pace of the drama is just nice. Not too hurried and not too slow. The director cooked the "Ramyun" throwing in different elements and character growth of the main cast. Bringing the characters into the ramyun store and attracting viewers with eye-candies.